I was inspired by this article to start an exercise routine. I liked the idea of a short, high intensity routine that could include both aerobic and strength training. Of course, I didn't think that I'd be able to do it at full intensity right away, so I decided not to really try. I'd do as much as I was comfortable with, and stop when it was too much, taking significantly longer breaks between exercises than suggested. And hopefully move up to the full routine when I was able. But I didn't want to take too long of a break--for example, however long it would take to look up whatever exercise I was supposed to do next. For that matter, how was I supposed to manage the timing? Since it was based on short timed bouts rather than number of exercises (which was part of the appeal), I'd have to keep track of the time, which is a little hard to do while doing push-ups. I decided the proper response was to write a program. 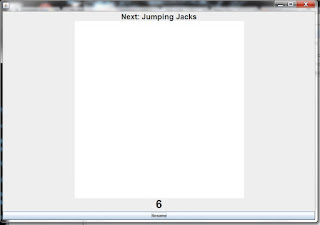 Since I'd been learning Java this past year, I had a pretty good idea how to write a Java program that would do most of what I wanted--show which exercise to do next, and time both the length of the exercise and the break between them (I wanted longer breaks between the exercise, but I still intended to keep it short). Of course, it would be even better if my program could tell me what the next exercise was without me having to look at the screen. So I found a Java-based voice synthesizer, Free TTS, and made that part of my program. I also incorporated the illustrations from the above article. The result is Exercise Helper. It tells you what the next exercise is (speaks it out loud, actually), shows you an image which shows you how to perform the exercise, and then counts down the time to start. Once you start, it times the duration of the exercise, while counting down out loud by ten second intervals (with a 3, 2, 1, done at the end). And then it moves on to the next exercise. 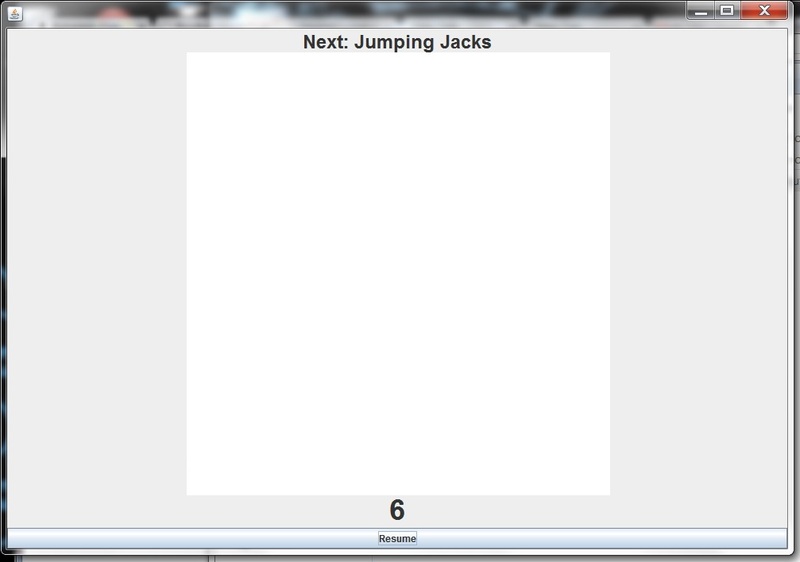 Screen shot of Exercise Helper, sans figure. I used the figures from the article, but since I'm not sure I can repost them here, the screenshot above blanks that part out. Overall, it's a very useful program for me, though I'd have to do some work on it before it would be helpful for others (including the ability to load and store your own set of exercises).